The Mario Party series has been a staple franchise for Nintendo since the days of N64. Following the success of the Switch, it was expected that Nintendo would be releasing a new game in order to maintain interest in their latest console. The first thing you’ll notice is that the name separates itself from previous entries by ditching the sequential number from the title, which is great because Super Mario Party rolls off the tongue much easier. Thankfully Nintendo has decided to go old school and ditch navigating the game board with all players lumped in one vehicle. Collecting the most stars and coins is still the main aim of the game though. Also, if you’ve ever played a Mario Party game in the past, you’ll know the excitement that can be had from rolling the dice towards the end of a game and stealing all the stars from another player, which has caused many a disagreement in our household. Players can boss the gameboard by collecting allies (other Mario characters), which will add a special dice to your overall roll, so even if you get a 0 or 1, your ally could contribute a 5 or 6 to help you move along to a space containing a mushroom item. It’s all about the mini-games! 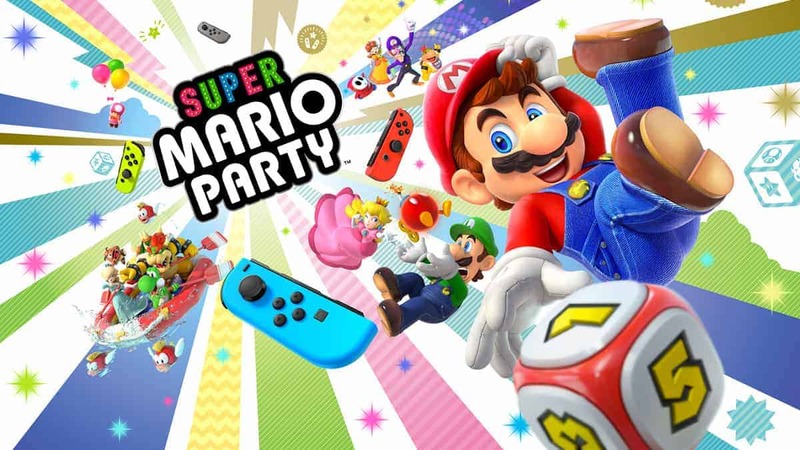 Super Mario Party is stacked with 80 mini-games created specifically for the joy-con controllers, so the best way to enjoy the game is on the big TV with multiple friends or as a family. Comparing the quality of the mini-games to other party games, this game has the best variety and randomness to satisfy any player. Don’t forget that if you’re the best performer during mini-game rounds, this will count for something as Toad and Toadette award further stars at the end of a game, so even if you haven’t collected any stars from the game board, you could still be the overall winner. Even though the Switch is not the most powerful console out there, playing the game in TV mode, it still looks the best Mario Party game ever made. The developers have poured lots of love on character animations that really pop off the screen. The quirkiest new addition is being able to link 2 Switch consoles in tabletop mode, but I’m yet to test this feature, as you need another person to have a Switch and a copy of the game. I get the sense this is a proof of concept feature, so it’s not essential to get full use of the game. Maybe it’s a likely situation to come about once more people have bought a Switch after Christmas. So who would this game be best suited for? New Switch owners are going to have a better time playing this game over 1-2-3 Switch. Both showcase the joy-con motion controls, but the Super Mario Party definitely has more variety and content. Also, you can’t compete for playable characters such as Mario, Peach or Shy Guy. For the little extra money, I would buy this party game over any other. It’s one for the collection that likely to see more game time and keep you entertained for years to come.